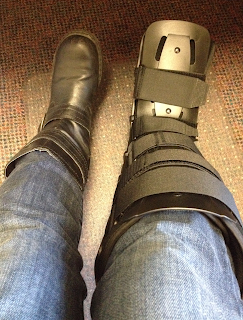 My very own walking boot! I have a stress fracture on my ankle and will be in the boot for at least four weeks. I guess it is a good reminder to slow down, take the time to enjoy the fall, and find some quiet time to reflect without running. The past few days I have enjoyed the stationary bike and some free weights. You better believe I will be back to long distance running before the end of the year, though I hope it is before Minnesota’s first bad winter storm! What are your best strategies for fitting in time for reflection, especially when your normal routine needs to be adjusted or changed? Mercury is in RETROGRADE!? WHAT?! "Giving Back To Our Institutions"
Careers in Student Affairs: It’s Here! I Have a Learning Disability, So What? Home for the Weekend: Sweet Home Chicago!